You would need 2 diodes and 1 resistor on each side. The parking light wire needs to run through the diode, then through the resistor, and to the positive of your flexible led strip. Run the “turn signal” wire through the other diode to the positive of your led strip. Connect the negative of the led strip to the ground wire. Just join the forum, ben lurking around for a few months. I just installed a few CCT and some LED strips…everything turn out AWSOME. Thanks to the Great info here. I was planing on wiring LED strips to the side skirt of my body Kit. I drive a 05 Acura TL and going to install the Aspec kit. I want to wire the LED strips to the turn signal, but there are 3 wires for the turn signal light. I think they are ground, signal, and parking light. I want my LED strips to turn on when I put on my turning light and parking light. Is there a way to do that??????????? I havent play around with wire it yet, maybe when it get a little warmer. I was thinking just to use a tap a wire to one of the wire and the ground and that might work. I have to play around with it. Anyone know or have any idea.? Should be pretty simple. Have the parking wire and the signal wire hooked up to the positive part of the LED strip, and put a diode on each one so it doesn’t feed back. Yeah, it’s pretty simple to do…. Each side will need 2 diodes and a resistor. You will run the parking light wire through a diode, then a resistor, and to the positive of the strip. The “Signal” wire will run through a diode to the positive of the strip. Then the negative of the strip to the ground wire. This will turn the strip on with your running lights, but they won’t be at full brightness. They will also flash with your turn signals at full brightness. oh, and “lurking” what do we have a stalker here? MX you are a genius. I would love to see a diagram for this along with a link to the type of diodes that are needed. I’m looking to do the same thing, so can you help me out as well? For cars that use the DRLs as turn signals, you can tap into the tirn signal wire under the dash for a “turn signal only” connection. Wow..thanks for all the help everyone. A Diagram would be Great! I never used any diode or resistor before..Im a noobie as you can see. But with all the help here Im sure I will get the hang ot it. Thanks for the Warm Welcome!! Oznuim Rocks!!! MX I’m going to squish your bug. As soon as my computer gets up and running smoothly, I’ll draw it out. Like MX said, learn to solder first. It’s not hard while working with big items that go w/ lighting (avoid surface mount until you’re better). Resistors don’t have a positive and negative terminal so it doesn’t matter which way they’re wired in the circuit. Diodes on the other hand do and it’s very important those are set up correctly. Funny you guys mentioned soldering, I was about to get into that. I held my first soldering iron last week after a computer fan wire broke off the circuit board. I was bored working the night shift and got some solder and a solder iron from a co-worker desk. His Iron sucked, the tip wasnt hot enough to melt the solder. I was looking online and was thinking about buying a cold heat soldering iron. What do you guys use any recommendation? Where can I buy resistors and diodes at a good price? Any other supplies I might need? I want to have everything ready, so I dont have to run around or wait..when i decide to do this mod. It looks complex for someone without much experience…. keep in mind you only need to be concerned with the parts within the dotted areas. I don’t know what the resistor value should be right now though… I don’t know enough about the LED strips. What length of strips do you want to use for each side. EDIT: Just saw your post. Downside to the cold heat irons (I work at Radio Shack, we sell a bunch of them) is that the tips are made of graphite, which is very brittle. If you touch it the wrong way, the tip will break. If you have a Radio Shack near you, get either the 15/30 watt switchable iron, or one of the 45 watt irons. Get you some solder, and one of the cheap tool sets. That will make life easier. Oh, and if you have a Radio Shack near you…. you can get most of your diodes, resistors, and other smaller things there… more complex IC’s and stuff like that will require ordering online. I personally don’t like cold heat soldering irons. I always seem to get a bad connection that doesn’t melt the solder through the whole wire. I just bought some of the 2.4″ strips in amber to make side mirror signals. With what Im seeing here I would like apply this wiring to them and make them into side markers AND turn signals. What size resister would be proper for the small strips? Is there a specific diode that would be best? Also, would you recomend using a project box with a little bread board in it and then just patch into the wiring harness or you just put the diode and resistor on the strip under heat shrink etc? I personally would put the diode and resistor under heat shrink in line with the wire like in the diagram. Which strips did you buy… I don’t see the Flexible LED Strips in Amber, could you put a link in here to the specific product you bought? Thanks for the input, I think I agree for simplicities sake. Part of my problem is that this will be my first LED install and I dont really know how physically large the diode will be and therfore how much space I will need for it. Since I am installing them on the side mirror it wont be easy to pull them out if some repair is required. I am already a little shy about installing them as I have read in these forums of people having the lights burn out in the flex strips. This could be due to improper wiring but none the less they dont seem to have the life that I would hope for in an LED. My mistake on the color. They are listed on the main flex strip page as Orange. I refer to it as amber in an automotive contex and, now that I have them (lighting fast shipping, thanks Oznium) they are within the color range of amber so I feel OK referring to them that way. Anyone have the specs for the resistor for the 2.4″ strips? To bench test the size of the resistor that you would need… buy a pack of several assorted sizes (they aren’t expensive) and hook up your LED strip to a 12V battery (I highly recommend a “N” size battery and a “N” size battery holder from Radio Shack, the will bench test anything that requires less than 500mA to operate) Put the resistor in series somewhere (positive or negative) and see how much the light dims, if you think it’s dim enough to be a running light, use that resistor, if you think its too bright, use a bigger resistor, if you think it’s too dark, use a smaller one. Repeat until you find a brightness that you like. Alright, I’m doing this in my ’01 Z24 Cavalier, I just bought the strips. When the turn signal is activated, the strip will flash from full brightness to resistor brightness and back? How exactly do the diodes function? The diodes on the running lamp wires stop current to allow full brightness with the signal? So basically, If you wired this circuit up and left out the 4 Diodes, if you turned your running lights on, all 6 Turn signals (Front Back and Side on both sides) as well as your regular running lights would light up. Then, when your Left turn signal was activated, your 3 Left turn signals would flash, as well as your front and rear running lights. Same goes for the Right side. So without them, the whole system kinda goes haywire, they keep the sections separate. Hope that explains it a little better, although Black DX did a great job. As for your other questions, the Resistor is what dims the signal for the running light part, that way if your Turn signals are on with the running lights off, they get a full 12 volt strobed from the turn signal wire. When the running lights are on, the resistor will lower the voltage to around 6V or half brightness. When the running lights are on and the turn signal is on, the voltage will flash from 6V to 12V and back, rather than the normal 0V to 12V and back. Thanks guys, I think I have all the information I need now. Thanks for the writeup mx, it makes much more sense now. I was wondering, if you were to hook it up to the brake light as well, how do you isolate the brake from the turn signal. The reason I ask is because when I turn on the indicator and I step on the brake the it goes solid. It will only flash when I release the brake. I have one diode each on the brake and turn signal wire. The turn signal on my truck is a dedicated turn signal. I read your question wrong, look into some logic gates. That would be the easiest way. 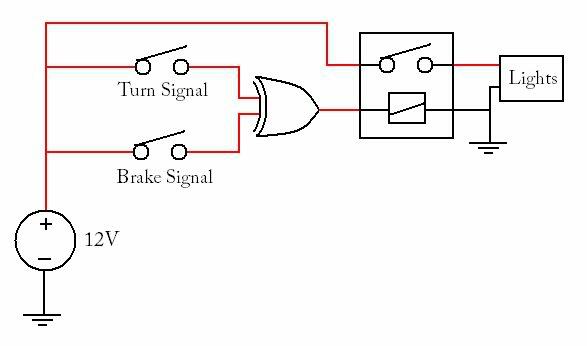 It’s a logic gate that will “filter” signals. Look into exclusive or gates (XOR Gate). Here’s a basic diagram. Thanks, I’ll look more into it. Once you start stringing relays together you can pretty much do anything you want, electrically. At the moment, I’m looking into white flex LED strips as DRL’s (Audi R8 style) that come on automatically under two conditions. 87a from my running lamp relay (so they shut off when I turn my headlight switch one notch) goes into a second relay as the constant source, and 12V+ from an add-a-circuit in the BCM fuse is the trigger for the second relay (so they come off when the key comes out). This should be sweeeet if I ever get it hooked up. man you guys are good. Hey you ever explain how you get those wheel wells so damn bright? Those just flex strips? And yeah everything I’ve learned about automotive wiring/lighting I’ve learned here. These guys are the best of the best.